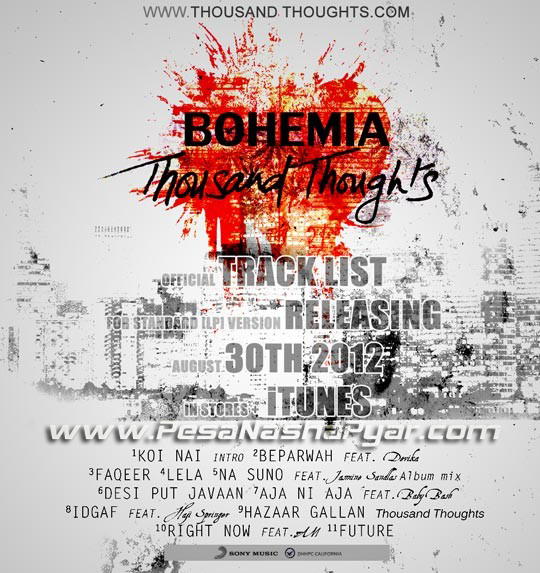 “Thousand Thoughts” the third official studio album by Bohemia is set to release August 30th 2012 by Sony Music Entertainment. The album is executive produced by Bohemia with guest appearances by producers and artists like multiplatinum selling Baby Bash, classical vocalist Devika Chawla who collaborated with Bohemia on Da rap star #1 selling album of 2009 [Punjab -Planet M/Music World Chart - UMG Top 5 albums], Prince Saheb up n’ coming producer from California making his debut with Punjabi music, Haji Springer and XSF of The Dragons, longtime friends of Bohemia. Checkout the teaser for Hazaar gallan the first video from the LP.